Delft ([dɛlft]) is a city and a municipality in the Netherlands. It is located in the province of South Holland, to the north of Rotterdam and south of The Hague. Delft is known for its historic town centre with canals, Delft Blue pottery, the Delft University of Technology, jurist Hugo Grotius, painter Johannes Vermeer and scientist Antony van Leeuwenhoek, and its association with the royal House of Orange-Nassau. 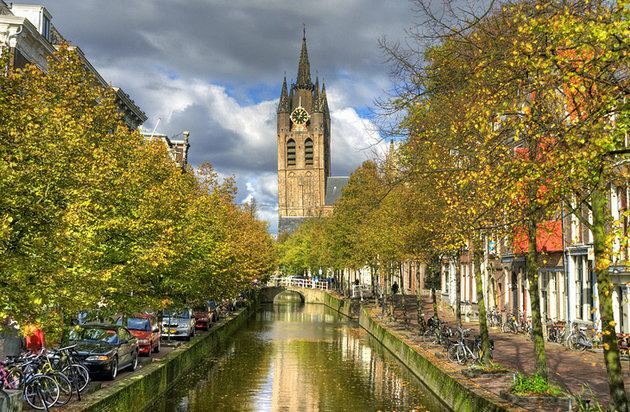 The city of Delft came into being aside a canal, the 'Delf', which comes from the word delven, meaning delving or digging, and led to the name Delft. It presumably started around the 11th century as a landlord court. From a rural village in the early Middle Ages, Delft developed to a city, that in the 13th century (1246) received its charter. (For some more information about the early development, see Gracht). The town's association with the House of Orange started when William of Orange (Willem van Oranje), nicknamed William the Silent (Willem de Zwijger), took up residence in 1572. At the time he was the leader of growing national Dutch resistance against Spanish occupation, known as the Eighty Years' War. By then Delft was one of the leading cities of Holland and it was equipped with the necessary city walls to serve as a headquarters. An attack by Spanish forces in October of that year was repelled. After the Act of Abjuration was proclaimed in 1581, Delft became the de facto capital of the newly independent Netherlands, as the seat of the Prince of Orange. The Delft Explosion, also known in history as the Delft Thunderclap, occurred on 12 October 1654 when a gunpowder store exploded, destroying much of the city. Over a hundred people were killed and thousands were wounded. About 30 tonnes (29.5 long tons; 33.1 short tons) of gunpowder were stored in barrels in a magazine in a former Clarissen convent in the Doelenkwartier district. Cornelis Soetens, the keeper of the magazine, opened the store to check a sample of the powder and a huge explosion followed. Luckily, many citizens were away, visiting a market in Schiedam or a fair in The Hague. Today, the explosion is remembered primarily for killing Rembrandt's most promising pupil, Carel Fabritius, and destroying almost his entire oeuvre; a pivotal event in Donna Tartt's Pulitzer Prize-winning 2013 novel The Goldfinch. Delft artist Egbert van der Poel painted several pictures of Delft showing the devastation. The city centre retains a large number of monumental buildings, whereas in many streets there are canals of which the borders are connected by typical bridges, altogether making this city a notable tourist destination. Nieuwe Kerk (New Church), constructed between 1381 and 1496. It contains the Dutch royal family's burial vault, which between funerals is sealed with a 5,000 kg (11,023 lb) cover stone. Windmill De Roos, a tower mill built c.1760. Restored to working order in 2013. Another windmill that formerly stood in Delft, Het Fortuyn, was dismantled in 1917 and re-erected at the Netherlands Open Air Museum, Arnhem, Gelderland in 1920. Delft is well known for the Delft pottery ceramic products which were styled on the imported Chinese porcelain of the 17th century. The city had an early start in this area since it was a home port of the Dutch East India Company. It can still be seen at the pottery factories De Koninklijke Porceleyne Fles (or Royal Delft) and De Delftse Pauw. Delft supports creative arts companies. From 2001 a building defunct from 1951, named Bacinol, housed small companies in the creative arts sector. Demolition of the building started in December 2009, to make way for the construction of the new railway tunnel in Delft. The occupants of the building, as well as the name Bacinol, moved to another building in the city. The name Bacinol relates to Dutch penicillin research during WWII. Delft University of Technology (TU Delft) is one of four universities of technology in the Netherlands. It was founded as an academy for civil engineering in 1842 by King William II. Today just under 20,000 students are enrolled. scientific research; (a.o. "TNO" ( Netherlands Organisation for Applied Scientific Research), Stichting Deltares, Nederlands Normalisatie-Instituut, UNESCO-IHE Institute for water education. retail; (IKEA ( Inter IKEA Systems B.V., owner and worldwide franchisor of the IKEA Concept, is based in Delft), Makro, Eneco Energy NV). East of Delft a relatively vast nature and recreation area called the "Delftse Hout" ("Delft Wood") is situated. Apart from a forest, through which bike-, horseride- and footpaths are leading, it also comprises a vast lake (suitable for swimming and windsurfing), narrow beaches, a restaurant, community gardens, plus campground and other recreational and sports facilities. (There is a possibility to rent bikes at the station). Inside the city apart from a central park there are also several smaller town parks, like "Nieuwe Plantage", "Agnetapark", "Kalverbos" and others. Furthermore, there's a Botanical Garden of the TU and an arboretum in Delftse Hout. Nuna is a series of manned solar-powered vehicles, built by students at the Delft University of Technology, that won the World solar challenge in Australia six times in the last eight editions (in 2001, 2003, 2005, 2007, 2013 and 2015). The so-called "Superbus" project aims to develop high-speed coaches capable of speeds of up to 250 kilometres per hour (155 mph) together with the supporting infrastructure including special highway lanes constructed separately next to the nation's highways; this project was led by Dutch astronaut professor Wubbo Ockels of the Delft University of Technology. Members of both Delft Student Rowingclubs Proteus-Eretes and Laga have won many international trophies, among which Olympic medals, in the past. The Human Power Team Delft & Amsterdam, a team consisting of mainly students at the Delft University of Technology, has won The World Human Powered Speed Challenge (WHPSC), an international contest for recumbents in the US state of Nevada with the aim of breaking speed records, four times and brought the world record on 133,78 kliometers an hour (83.13 mph) in 2013. Delft railway station; (in February 2015 a new station has been taken into use). Trains stopping at these stations connect Delft with, among others, nearby cities of Rotterdam and The Hague, up to every five minutes, for most of the day. There are several bus routes from Delft to similar destinations. Trams frequently travel between Delft and The Hague via special double tracks crossing the city. One of those two lines (19) is still under construction inside Delft and is meant to connect The Hague with a science park, which being developed on the southern (Rotterdam) side of Delft and is a joint project by the Delft and Rotterdam municipalities.